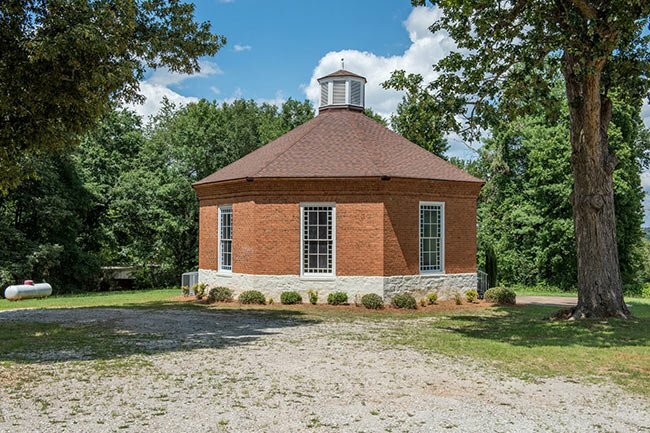 Unusual in its design, this octagonal church in the Conestee community of Greenville is one of only three similarly-shaped churches in the United States. 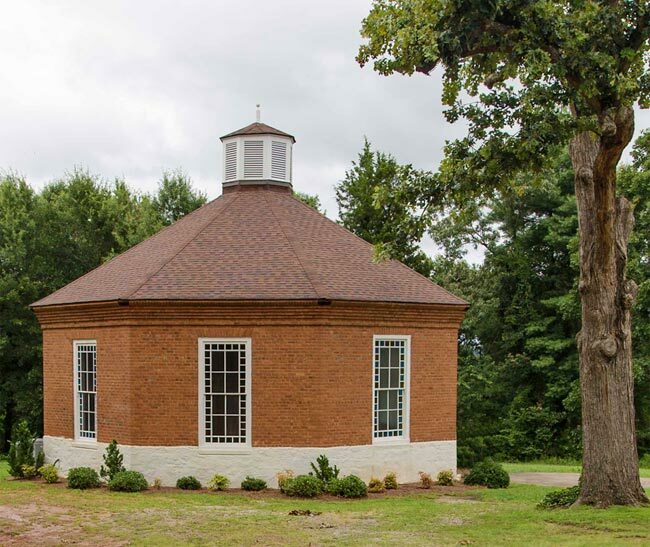 Also known as McBee Chapel, the structure was built in 1841 by John Adams, a millwright and mechanical engineer from Stirlingshire, Scotland, who came to America in 1834 to practice his trade. Adams ended up in Lincolnton, North Carolina, where he met Vardry McBee. Known as the “Father of Greenville,” McBee had purchased land around what is now downtown Greenville and developed a village along the Reedy River. Acting as an absentee landlord, he established a sawmill, gristmill, and store. In the early 1830s McBee acquired more land along the river in Conestee and finally moved to Greenville County, along with Adams. The men developed a large paper and textile mill, now known as Conestee Mill. At the time, the mill was known as McBee Manufacturing. 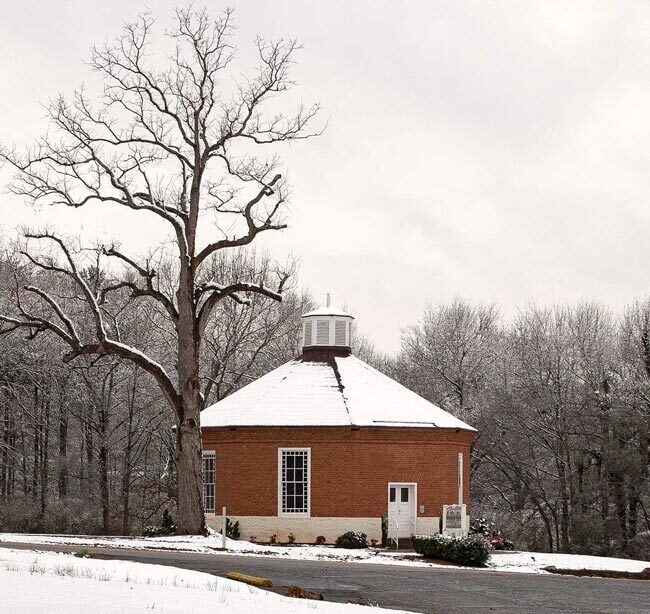 The Methodist church in the Conestee mill community was established and built in 1841, and Adams, Vardry’s trusty engineer, designed the chapel in its celebrated octagon. Adams’ purpose in his design was to create more floor space. 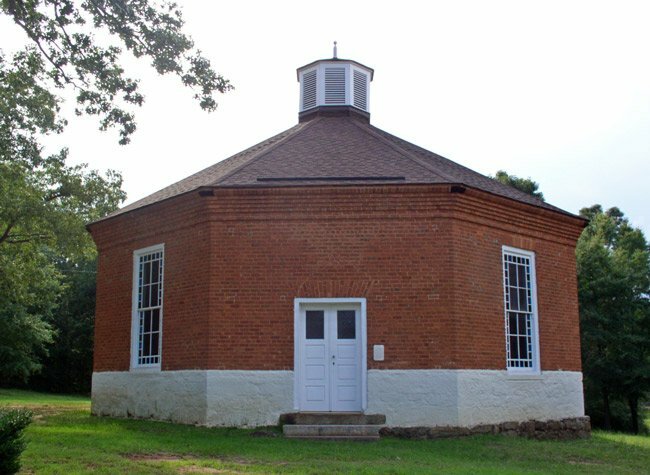 Included in the original chapel was a slave gallery – now a balcony – and an octagonal cupola, still extant. 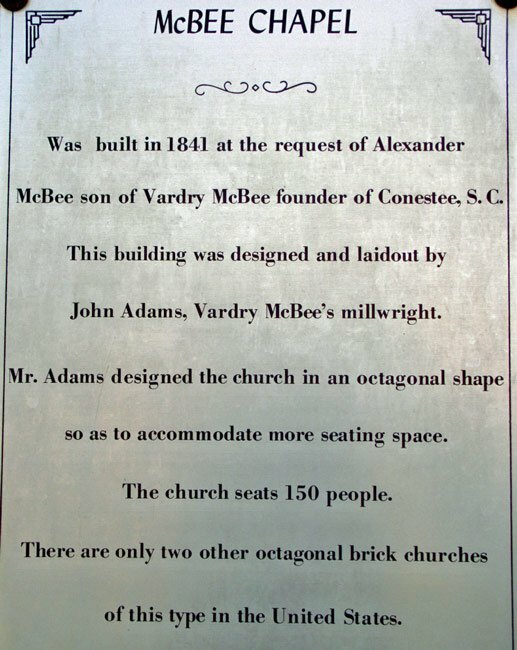 The church’s name honors Vardy McBee as well as his son, Alexander McBee, both who donated money and land for the construction of the church. Adams also engineered the dam at Conestee that powered the mill, and he also designed other mills – mostly corn and flour mills – in the Conestee area while employed by McBee. Adams served as McBee’s mechanical supervisor for more than 20 years. McBee United Methodist Church, which seats around 150 people, remains active today. (McBee Chapel) Architecturally unique, McBee Methodist Church was designed ca. 1842 by John Adams, a local wheelwright who felt that more seating space could be secured by an octagonal arrangement. The little structure is a fine example of octagonal architecture in vogue in the United States from the 1840s-1860s, its prime advantage being that it encloses one-fifth more floor area than a square with the same total length of wall. In addition, octagonal design offered a new aesthetic dimension to American architecture at this time. 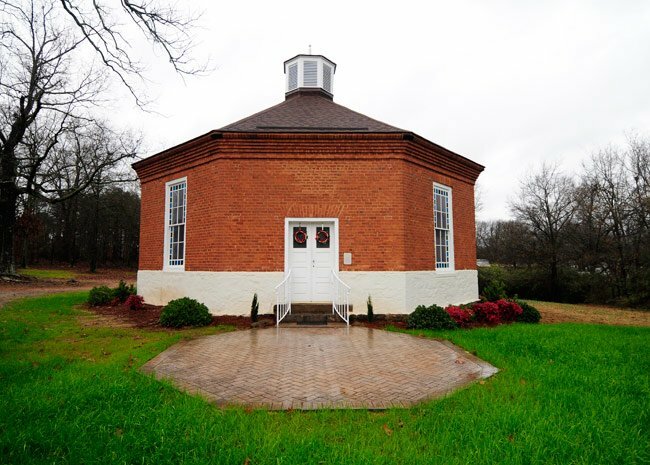 The eight-sided brick structure has a pyramidal asphalt shingle roof topped by an octagonal louvered cupola. It also features a molded brick cornice and a whitewashed base. The small stained glass panes surrounding larger panes of clear glass were added at a later date. The balcony, formerly used by slaves prior to the Civil War, was later removed and its door converted to another window. The church has a seating capacity of 150. 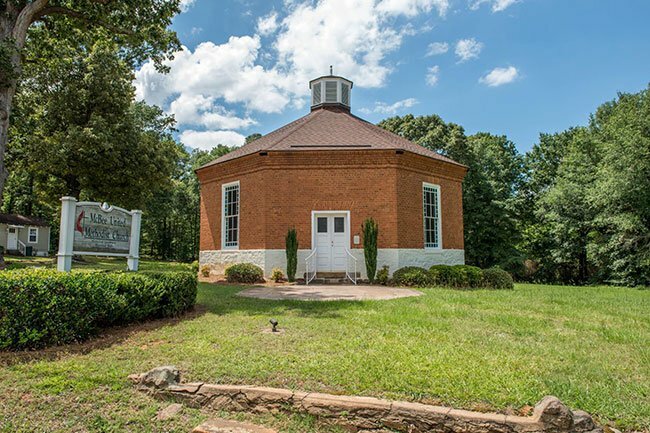 The church was named for Vardry McBee, the “Father of Greenville” who provided funds for the little church. I am from the John McBee family, our Church was built 1878. It is in need of repairs. We have the cementary. I remember the McBee reunions at the Church. with tea in the big crocks. When my husband got home from Korea’s front line, I took him the reunion. He only has one brother and few relatives. He stood up on the steps and said “All of these people are related to you” Of course i Proudly said YES. I am so proud. Thank you God for putting me in this family.